Quest Interactive Solutions 3.0 features a new design and interfaces seamlessly with Just In Time Digital's isMOD (in-store manufacturing on demand) unit to supply your customers with the ultimate "just in time" inventory option. Featuring over 1,500 EMI titles and almost 2,000 Christian World soundtracks as well as the Just Me Music line of personalized children's CDs (VeggieTales, Elmo, Barney, The Wiggles and Disney). 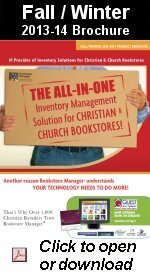 Find out what a difference a partnership with Bookstore Manager can make. Visit us in Booth #321! EyeOnInventory is a reporting tool designed to enhance your level of inventory management and impact sales.